I mentioned type 3 fun in a previous posting, and although there was plenty of type 1 fun to be had in Icy Strait I'd like to begin this post with a little description of some type 3 fun. As a reminder, the definition of type 3 fun is something that is lame when you do it, and remains lame and not fun even in the retelling. Thus was our bike tour of Hoonah. I should start out by saying that it is not the fault of the bike tour guide, or anyone else involved with tours at Icy Straits. We signed up for the bike tour / zip line combination tour through the cruise line because that was the only way we could sign up for a zip line tour in the afternoon. The idea of an eight mile bike ride sounded appealing, a bike tour is a great way to see an area at a faster pace than walking, and is a nice way to get to know an area better than you do in a tour bus. but, the simple truth is that Hoonah is a nice small fishing town in Alaska, but there really isn't that much to see. So, we saw the ferry terminal (3-4 ferries per week), the office bar, the seaplane dock, the library, the post office, and the airport. Oh yeah, and it was RAINING yes really really raining. We were absolutely soaked to the bone through our pants and jackets and everything. Yuck! We all agreed that what we should have done was just not ride the bikes. We could have stayed at the visitor center for a while staying warm and dry and then gotten on the bus to the top of the zip line. Our mistake. So, yes a wet cold bike ride through a town of 800 is virtually the definition of type 3 fun. But, lets leave that in the past and talk about the highlights of our day in Icy Strait. It began in the morning with our whale watching adventure. We had booked a small tour with a private operator. I would highly recommend that everyone does this. The small boats are so much more nimble, and you get to know some of the local people in a way that you can't when you are on a big boat with 100 other people. So it happened that there were only six of us on the boat with captain Floyd. We had plenty of room to spread out and we were not vying for position with other people when the whales showed up. As whale watching trips go, this one just couldn't be beat. We were not even out of the harbor before we were treated to a humpback bubble netting. Bubble netting is one feeding strategy used by the humpacks. They circle under the water making tons of bubbles that confuse the smelt to the point where they don't know which way is up. Then the whale swoops in from below with mouth wide open and scoops up hundreds of gallons of water and fish. The whale closes its mouth and strains out all the yummy fish through its baleen. Here's a picture of the first whale we encountered. Now, of course, anyone who has ever been on a whale watching trip has seen lots of whale tails. 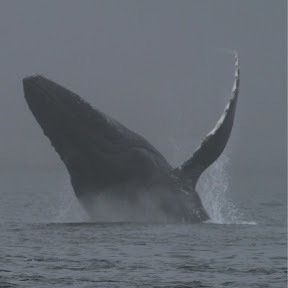 As the humpbacks typically come up, show their hump for a while, and then dive deep. When they dive deep they do so with their tail straight up in the air. What most people do not get the opportunity to see first hand is a humpback breaching. This is when the whale propels its whole body out of the water. This is an amazing feet for an animal that averages 40 feet in length and weighs about 1000 pounds per foot of length! 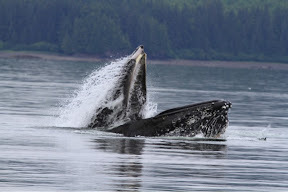 We were lucky enough to see several such breaches. I was lucky enough to have my camera pointed in the right direction when this one happened! Finally, we were in for one more bonus. Orcas! 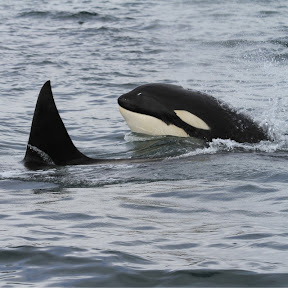 Its pretty rare to get to see Orcas on a whale watching trip! After watching the humpbacks for a while our captain informed us that there were Orcas in the area. This is another great example of the benefit of going on a smaller ship. The captain can just take off and follow the whales you want to see. Here are two Orcas from the small pod we were following. For a while we thought we were going to see the death of one of the sea lions swimming perilously close to this group, but I guess they were not hungry at the time. The dorsal fin in the picture above is about six feet tall! So, the whale watching was awesome, but our final act of the day was also a real blast. The worlds longest, highest, fastest zip line! Its a one shot ride from the top of the mountain outside of hoonah, down to sea level. This was really a stretch for Holly, who is a not a lover of heights, but the ride was fun. Unlike other zip lines, this one actually has a harness that allows you to sit quite comfortably. You don't have any brakes to worry about as that is taken care of for you at the bottom by Physics. At the top of the zip line you brace your feet against the starting gate, six people at a time, and then they count down from three. The gates open and you are off. In our case we started out in the clouds, flying downward. Suddenly you are out of the clouds and the ship and the water all come into beautiful view right in front of your eyes. In just about 90 seconds the ride is over, but its a real thrill. I've got some great video from the head mounted camera, but I'll have to wait until I get home to edit that and post it.